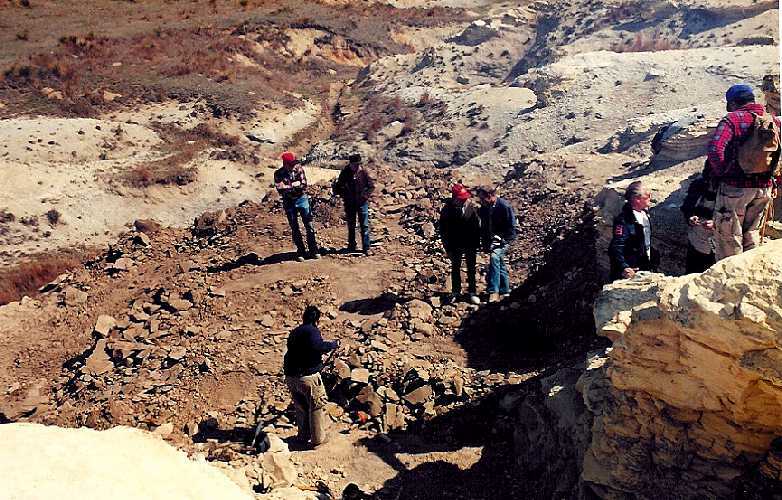 On May 2, 1997, we re-opened the Tylosaurus proriger site in eastern Gove County, Kansas. 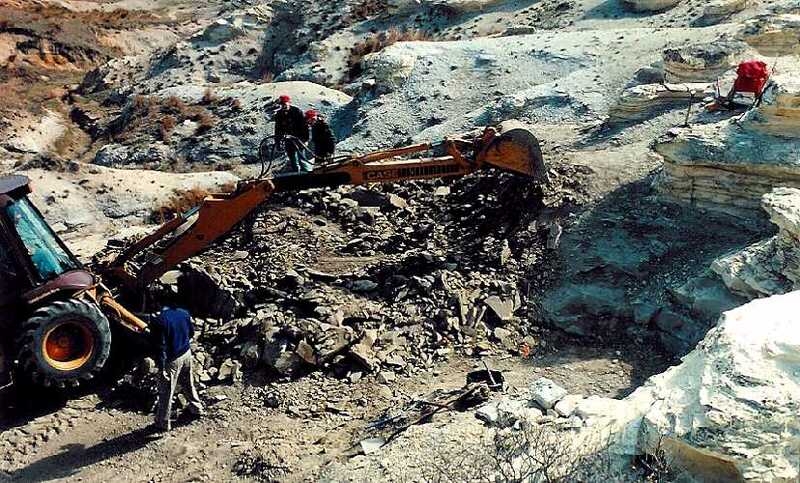 The skull and seven cervical vertebrae had been removed in September, 1996, then prepared during the winter and donated to the Fick Fossil and History Museum in Oakley, Kansas, by the property owners on April 19, 1997. The rest of the remains are also to go to the Fick Museum as they are removed and prepared. At the time that the skull was removed, there was a single vertebra visible on the north side of the gully that had initially exposed the specimen. 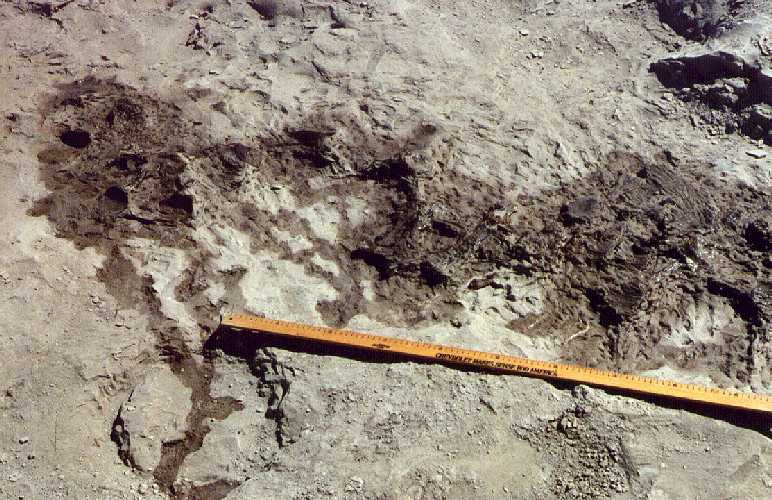 The vertebra was left in place to serve as a starting point for further excavation during the 1997 field season. Prior to our arrival, the landowner had graded an access road down a narrow erosional channel to the west of where the fossil was located. If nothing else, this meant we wouldn't have to carry the rest of the fossil "up the hill". 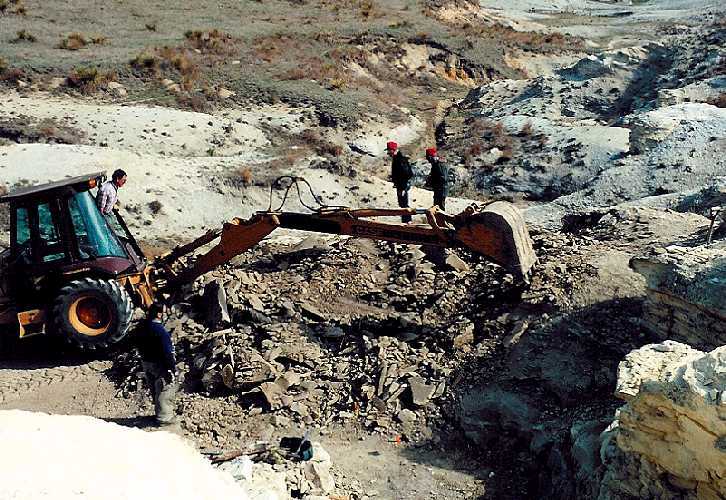 When the north side of the gully was exposed initially, two major additional areas of bone were encountered. About two feet to the west of "vertebra #1", another vertebra was found. Between these two vertebrae, a large flat bone was also exposed. A third, smaller area of bone was found adjacent to and east of vertebra #1. Additional digging showed that the new vertebra was articulated to another, and a third. The flat bone was completely exposed and determined to be a humerus or femur (it was a femur). The third area turned out to be the anterior end of a partial vertebra. The digging was stopped at about 6 PM and we went to check on arrangements for a backhoe to remove about 3 feet of overlying chalk. 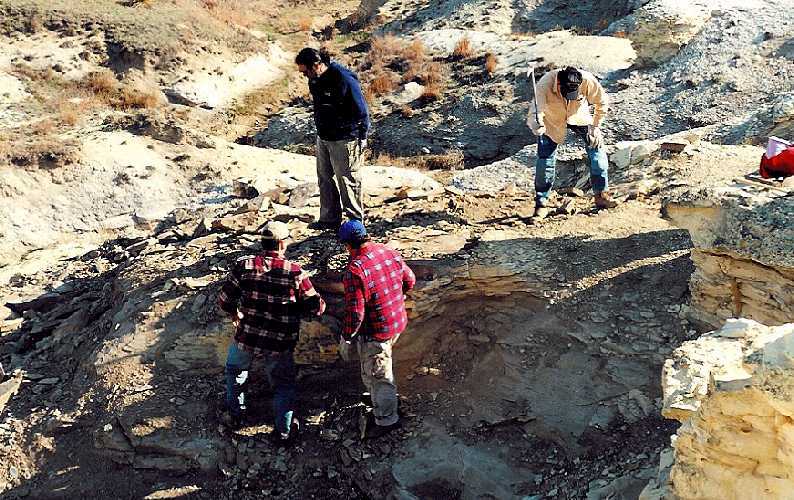 By 10:30, an area about 20 by 20 feet was cleared down to a level about 6 inches above the fossil bearing layer. After some additional grading to remove debris from the working face, we got down to the hard work. The layer of chalk covering the bones was very tough and broke in conchoidal pieces instead of stripping off in layers like most chalk does. This made finding the bones literally a hit or miss operation and an occasional "uh, oh" was the most common exclamation heard for the next several hours. An aerial view of the site, looking to the west. Vertebra #1 turned out to be a loner, apparently a thoracic that had been moved slightly away from the main bone field. There was a section of rib laying with it and the partial vertebra laying next to it. Nothing else was found associated with the limb bone. The three articulated (abdominal) vertebrae turned out to be a string of seven that led to half of the pelvis (actually just the ischium and pubis). The ilium which should connect to the pygal vertebrae in the hip region was not found. It may still be underneath the other bones. A partial fish vertebra, a small, unidentified bone and a Squalicorax shark tooth were also found in this area. In the area between the abdominal vertebrae and the pelvis, several (four at last count) caudal vertebrae were found. Then to the west, an additional eight caudal vertebrae were scattered along a westward trending line. 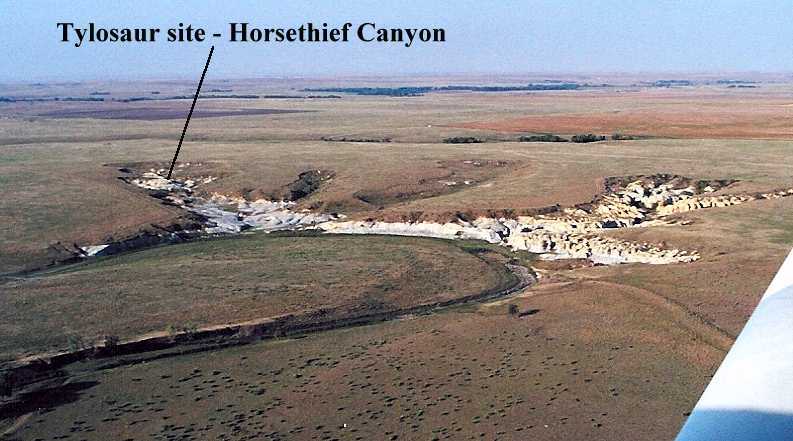 There was a space of 3-4 feet still unexposed between these vertebrae and the edge of the outcrop. We worked the site until about 6 PM that day. The next morning (May 4), we and then did some further clean-up and preparation for covering. Vertebra #1, the femur and an outlying caudal vertebra were removed because of their isolated positions. Photographs were taken of the area prior to covering with a blue tarp. The tarp was weighted down with rocks and a drainage channel was cleared around the exposed bones. The 'bone field' - all that remains from the lower portion of the mosasaur's body. The abdominal vertebrae are in the right side of the picture, with the pelvis and scattered caudal vertebrae on the left side. Sorry about the lack of contrast in this picture, but final preparation of the bone will have to wait until after it is removed from the matrix. Scale = 1 meter. SUMMARY OF PHASE II OF THE DIG: Contrary to our expectations, the mosasaur skeleton went generally to the west instead of the north. This means that some of the tail (caudal vertebrae) were lost at the edge of the exposure. It also appears that most of the thoracic vertebrae and ribs were in the erosion channel and are lost. Measurements taken from where the back of the skull was located to the hips are consistent with that distance (7-8 feet) in a 30 foot long mosasaur, so it seems that most of the bones did not move far. The lack of rib and front limb bones is a bit puzzling given that the skull was remarkably complete and little or no evidence of scavenging has been found. 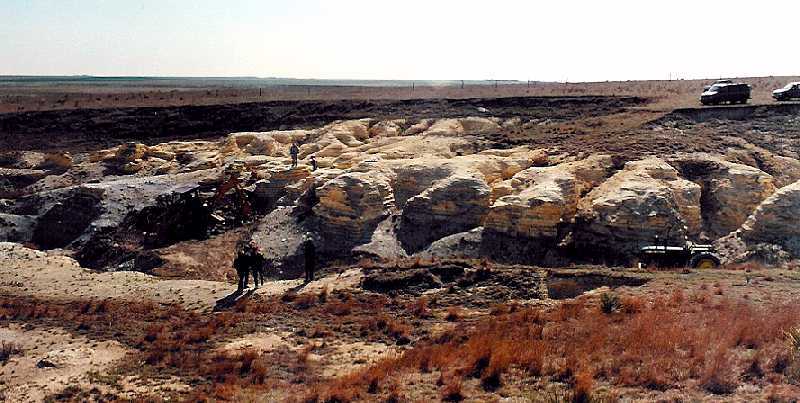 Further exploratory digging will be necessary to insure that additional pieces of the specimen are not located to the north of the main bone field. The dig will resume in late June.